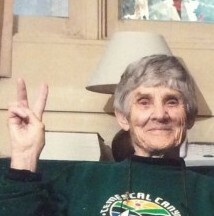 Maria in a typically relaxed pose, 2012. 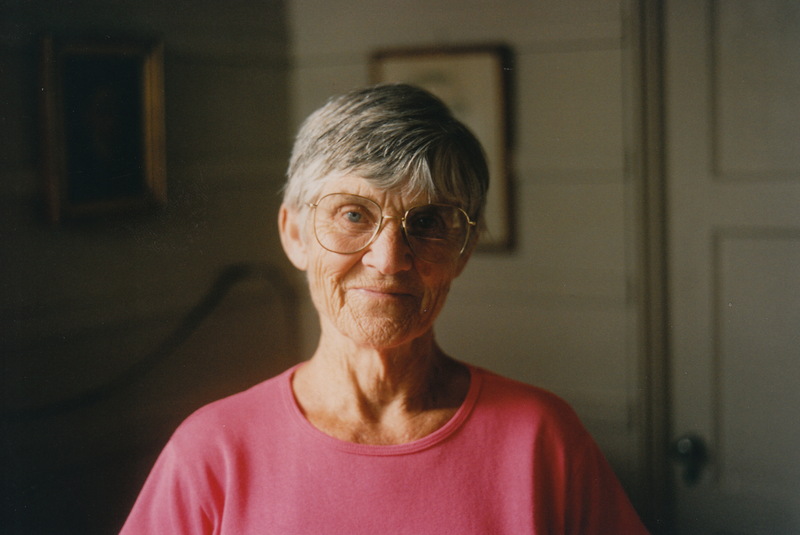 Maria, in 1996. Taken by Margaret A.M. Murray, for her book, Women Becoming Mathematicians. I’m ready to give a first go at telling the first story of the three German women who inspired me and whose life stories serve as remarkable documents of the tumultuous history of the 20th century in Europe. I was hoping to get some better pictures of Maria–this is the only one I can find–and more anecdotes of her life, but I’m going to begin by compiling what I have already accumulated, and include my own memories of her, too. 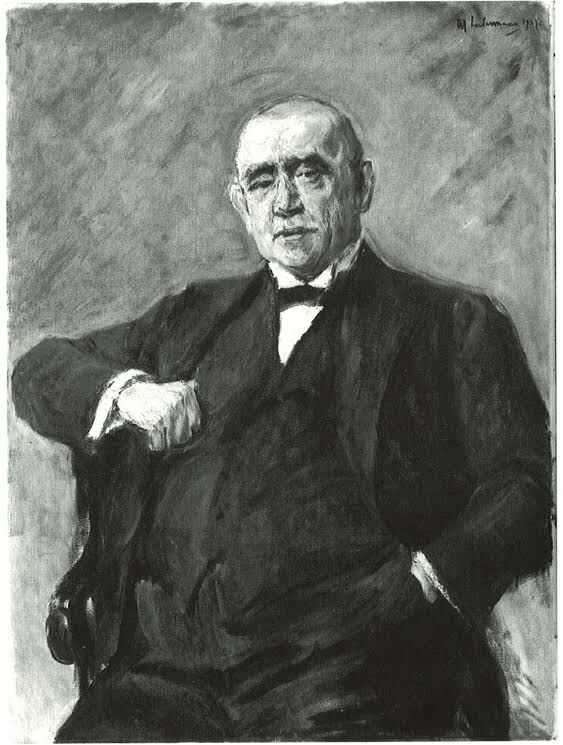 Maria’s father, August Weber, painted by Max Liebermann, 1926. Mesdag Museum, The Hague. Maria’s mother was Marie Cohn (1887-1967), the eldest daughter of Dr. Heinrich Cohn, director of a private Berlin bank founded by one of the most established Jewish families, the Meyer-Cohns, in Berlin. She grew up in privilege with private art lessons along with the niece of the famous Berlin artist Max Liebermann. 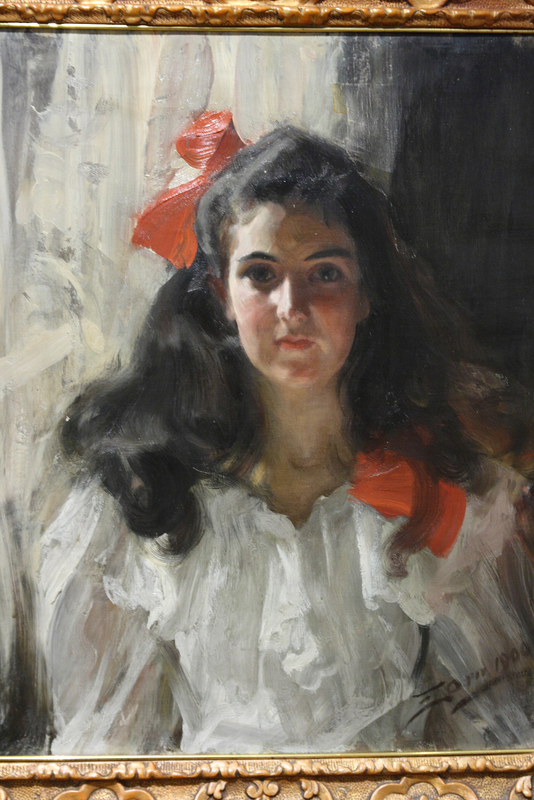 As a 13-year-old, she had her portrait painted by the Swedish artist Anders Zorn (the topic of the article above); the painting hung in her parents’ Berlin apartment until 1933, when Marie’s parents fled from the Nazis to Switzerland. They sold the painting (through the connections of the famous art dealer Paul Cassirer) before they left Berlin. It somehow ended up in Sweden in a private collection, and has been shown in several exhibitions. Maria’s mother, Marie Cohn, painted as a 13-year-old by Anders Zorn, 1900. Maria’s mother was not only a great beauty, but a remarkably well-educated and artistic person. She was privately tutored as a child (I think Maria told me her tutors were English, so she always had a fondness for England) until she went to university and received a Ph.D. in history, as one of the first women to receive her doctorate. According to an interview Maria gave many years later, her mother was a tremendous influence on her. She married in 1914, and their household hosted many distinguished guests, artists and politicians alike. Maria remembered that the Expressionist sculptor Ernst Barlach was a frequent guest, and her mother’s family were certainly part of the same circles in which Max Liebermann worked. The Weber family also renovated a large country house in Löpten bei Groß Köris, a small village south of Berlin, where their father built several workers’ houses, brought electricity to the village, and worked the land. There is still a Weberweg in the town today. Maria remembered her parents having many summer parties–one at which her father had to remove a relative who arrived in Nazi uniform. Maria recounted to me how she saw them walking at the edge of the grounds, as her father told the cousin sternly that such uniforms were not welcome at their home. The signs were already ominous by the end of the 1920s. Then, in 1933 when Maria and her twin sister were 14, the Nazis came to power. Everything changed. Her father was forced to resign his post and was imprisoned and interrogated several times by the Gestapo,but was always let go. Having a Jewish wife, he recognized immediately the danger to the family. Maria and her sister were sent to Switzerland, to Geneva, where her mother’s parents had already fled. And there she stayed for many years, while all of her family managed to escape Germany for London in 1938. (Her mother, Maria said, adapted quite quickly, while her father hesitated until the last moment to leave Germany–not until July 1939–and was never comfortable in exile.) They lost everything, of course; I remember Maria talking about going back to the country house when it was still in East Germany in the 1970s, and finding that their old servants had moved into the house. They were not at all happy to see Maria and her siblings return! As I remember it, none of them ever got any compensation for their property. 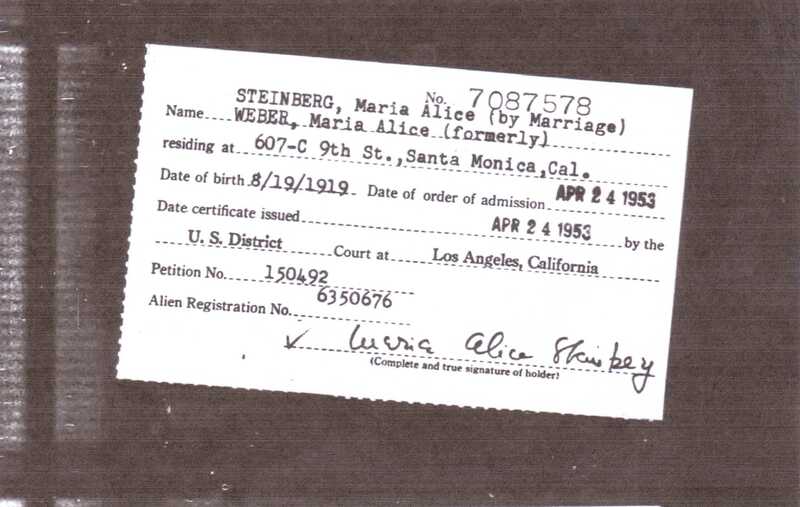 In about 1991, Maria, who had been volunteering at the Sierra Club, found out about the Rifkind Center at LACMA, and offered her services as a volunteer. The then librarian Susan Trauger said that at the time, when she was 72, she vowed she would stop working there when she was 75. She was still at the Rifkind when I started working there in 2004. She was amazing: at 83 and 85, she still climbed the ladders to shelve books, and typed labels for us. She was invaluable in reading old German letters, as the only one among us who could still read Alte Schrift. And she was a delight to talk to about her life and about politics and life in general, for despite all the travails, she was never bitter and thought she had been extraordinarily lucky in her career and in her marriage. I know she would have loved to have children, but she told me it never happened and fertility trials were not successful. She was so excited to see the reproductions of the portraits of her mother and father when the books arrived in the library, and she was always surprising us with her recollections of the famous people who had been part of her life as a girl. She would take the bus from her home to LACMA, which was a rather arduous trek, and then Bobby would pick her up, still driving into his 90s. They loved doing crosswords together, and she almost always finished the New York Times crossword on her trip to the Museum. She was still riding her bike every weekend until she was in her late 80s. But things did begin to slow down for both of them as they reached 90, and she stopped her volunteer work. Susan and I did go to visit them at their house, and had simple little meals with them both. They still had cats and their garden, and she still had a few mementos of her German life, including a small drawing of her father by Liebermann. Her twin sister died in 2011, right before our last visit to them. I remember then how she reasserted her firm atheism: “when I’m gone, I’m gone.” Spoken like a true scientist! We were devastated when we learned, only at the announcement of Bobby’s death, that she had died the year before, on July 7, 2013. We had somehow lost touch in those last years. And when I went to find an obituary, I only found a small announcement in a science organization’s newsletter (which I can’t even find anymore). She deserved more than that! So this is for you, Maria: mit Liebe und glückliche Erinnerung. I would be very grateful to hear from anyone who knew Maria, to fill in the gaps, and to add to this memorial to a wonderful woman.